CLAHRC staff and Fellows from both cohorts 1 and 2 came together on 1 December, to celebrate the end of the first Fellowship year at the CLAHRC CP. There were presentations from each of the cohort 1 Fellows, highlighting the outcomes from their CLAHRC project as well as their personal reflections about what went well, the challenges they faced, and what they got out of their involvement with the CLAHRC over the past year. For many Fellows, the CLAHRC had given them the dedicated study time, the tools, and the support needed to explore a research question of direct relevance to their role. Mai Luen Wong talked about her analysis of frequent attender data at Addenbrookes Emergency Department, and how her research enabled her to put informed, evidence-based recommendations to the Trust’s frequent attender working group. Fergus Gracey’s project mapped patterns of service use in a specialist service for children with acquired brain injury, and used simulation modelling to understand the cost and revenue implications. The model is helping to improve utilisation of staff resources to meet the complex patterns of client needs. 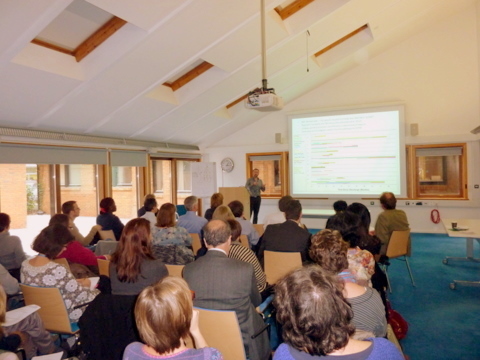 While most Fellows came to the CLARHC with their own project ideas, others got involved in existing CLAHRC research. Katy Harrison, Pete Hadfield and Miranda Fyfe joined the End of Life Care theme and took on research roles in various studies. For them, the benefits of this approach were working as part of a team, developing a range of research skills and experiences and being able to start straight away on projects that had already been developed. The CLAHRC Fellows have made a valuable contribution to the CLAHRC, bringing a different set of experiences and perspectives to the research; acting as local “research champions”; and helping the CLARHC to connect with healthcare practitioners in the community.